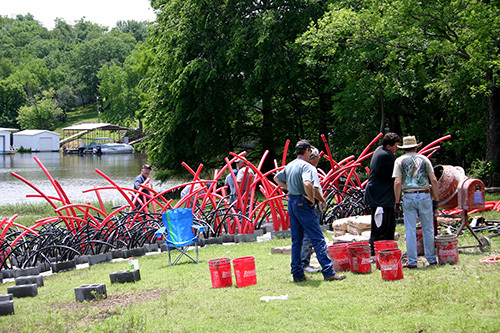 Original Rush For Brush … Volunteers help the GRDA Ecosystems Management Department build artificial fish habitats in this flashback photo from 2007. This was at the first workshop, held on Lake Hudson. The Grand River Dam Authority Ecosystems Management Department held its first Rush for Brush workshop of the season a couple of weeks ago, but if you did not have the chance to participate in that one, you need to put Saturday, May 18 on your calendar. On that date, GRDA will bring its innovative and award-winning fisheries enhancement program to Langley, in the lower parking lot near the Ecosystems and Education Center. The workshop will begin at 9AM and, as always, GRDA will provide the materials while volunteers provide the manpower. Believe it or not, 2019 marks the 13th year that GRDA has been hosting Rush for Brush workshops around the shores of Grand and Hudson lakes. During that time, thousands of the artificial habitats have been constructed and placed in those lake waters. However, there is room for more. GRDA first began the Rush for Brush program in the spring of 2007, with a handful of habitats constructed by a few volunteers. Since then, the program has steadily grown, thanks in large part to a sizable group of volunteers that now shows up to build the habitats and then take them along for placement in the waters. Just last year, in May of 2018, the program was named as a 2018 recipient of the National Hydropower Association’s Outstanding Stewards of America’s Waters award. In 2017, it was also recognized on the state level by the Keep Oklahoma Beautiful organization. Once again, if you want to take part in the next event, plan on May 18 in Langley and contact GRDA’s Jacklyn Jaggars at (918) 256-0723 to register.